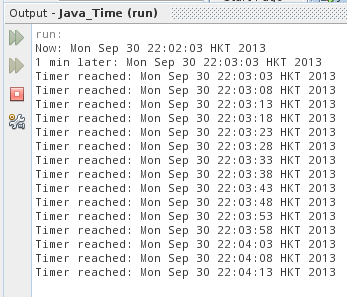 Java-Buddy: Run TimerTask in scheduled, repeated fixed-rate. Example to trigger scheduled, repeated fixed-rate TimerTask, by calling timer.scheduleAtFixedRate(). Thank you very much. This was _exactly_ what I was looking for. Your example is simple and easy to understand, had no problems to implement it. Oracle Doc is pretty good for more details. Hope it will also work in a Java FX8 environment I'm targeting to.